How behavioural study of criminal minds can strengthen your organisation's anti-fraud initiatives? 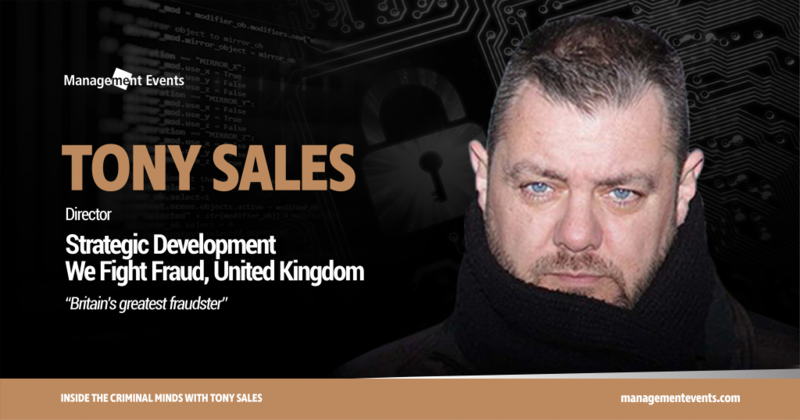 Gain insights from Britain's Greatest Fraudster Tony Sales on combating frauds in the digital era. Global efforts in fraud detection and prevention have been accelerating in full-speed, given the complex risk landscape of the digital transformation. Organisations are experiencing a virtual one-upmanship anti-fraud game. While the number of reported frauds skyrockets by the day, scammers are still getting away with it, leaving most companies fighting blindfolded. Get an inside scoop from Tony Sales, reformed fraudster, as he talks cyber security and internal frauds from a criminal’s perspective. What and how frauds are threatening your organisation? The financial gain for modern fraudsters lies in the data that they can harvest. As such, information theft is becoming rampant and ever-more sophisticated. Fraud trends in 2018 see a proliferation of identity fraud across all industries. In business cases, fraudsters would impersonate or hijack the corporate identity to defraud creditors and suppliers, financial institutions and other business alliances, even the government. Corporate frauds have also gained traction as the 4th most frequently reported case, according to PwC’s Global Economic Crime and Fraud Survey 2018. Fraud and misconduct will impact on the company’s regulatory compliance, reputation and public trust. Hence, it’s critical for leaders to strengthen their fraud risk management and treat it as an integral business strategy. In combating frauds, one of the most crucial steps is profiling cyber-criminals to assess their motivations and tactics of operation. A complete fraud prevention framework must ensure a thorough understanding of a perpetrator’s fraudulent activities in order to anticipate future attacks. In fact, digital innovation is only second to safeguard business, the human element in fighting frauds is equally important. Whether it’s asset misappropriation, financial statement fraud, information and intellectual property theft, or online scams, fraudsters commit this deviant behaviour for various reasons. Once dubbed Britain’s greatest fraudster, Tony Sales is now leading a global team of loss prevention experts, helping organisations across the public to private sectors to fight frauds. “I have always been against fraud that targets the old and vulnerable, there are now so many cases of frauds that actually impacts victim’s life savings, I just felt I had to help”, said Tony Sales as he explained the transition from a criminal to fraud expert and the formation of We Fight Fraud. Today’s hackers are mostly driven by money or simply by the fact to say they can do it. It means that no one is safe from frauds. To safeguard your business in this tumbling digital transformation roadmap, risk management and fraud analytics must be adopted as business-as-usual. Join Tony Sales to gain insights into fraud prevention strategies from a whole new perspective at the upcoming Internal Audit and Fraud Analytics event.